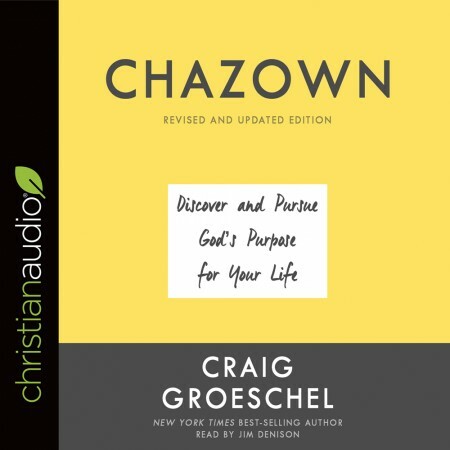 “Everyone ends up somewhere in life, but very few end up somewhere on purpose.” That is the main premise of Chazown by Craig Groeschel. “Chazown” is a Hebrew word that means “vision” or “dream,” and is used by Groeschel to describe that purpose for which God created you. The book Chazown is meant to be a guide for discovering that ultimate purpose, and fully living in it. Chazown is not a long book, and it is composed of several very short chapters, giving the book a quick, fun, effervescent feel. Groeschel’s light-hearted and approachable writing style only adds to this particular pathos. He comes across as a trustworthy guide, and when dealing with topics as touchy as life-direction and identity, this is probably a good thing. Groeschel points out that every person’s chazown is discovered where their core values, spiritual gifts, and experiences overlap. He then turns his attention to the practical: how do you live out your chazown? Five “spokes” are identified that need to be in place for successful living of a chazown. These are areas where we must “succeed small in order to succeed big.” The five spokes are: relationship with God, relationships with people, finances, health and fitness, and work. Chazown succeeds as a self-help book in two ways. First, it isn’t really a self-help book as much as a call to draw near to God and listen closely in order to find life purpose. Unfortunately, this activity is foreign to many believers and many live aimless lives as a result. Second, Groeschel is able to be systematic and comprehensive without coming across as constrictive and clinical. His outline for discovery and execution leaves room for people to “move around” as they work to discover their unique design. I think this book works best as a focused call-to-action. Groeschel’s purpose is to get the reader moving and working for the expansion of the Kingdom of God. But he isn’t content just to call the reader to action; he wants movement with purpose and direction. I recommend this book for any and all who have yet to find their “sweet spot” in the Kingdom. Read this book, and go find your chazown.